Help us ensure this historic landmark will remain the centerpiece in the great history of New Orleans! Click here to read the bulletin for this week! 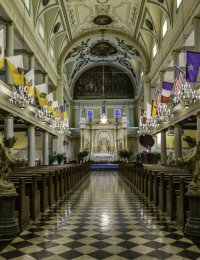 The St. Louis Cathedral is one of New Orleans' most notable landmarks. Few cities in the world are so identified by a building as is New Orleans. The city is instantly recognized by our cathedral and its position overlooking Jackson Square. This venerable building, its triple steeples towering above its historic neighbors, the Cabildo and the Presbytere - looks down benignly on the green of the Square and General Andrew Jackson on his bronze horse and on the block-long Pontalba Buildings with their lacy ironwork galleries. Truly, this is the heart of old New Orleans. The Cathedral-Basilica of St. Louis King of France is the oldest Catholic cathedral in continual use in the United States. If you would like to make a donation, please see box below.